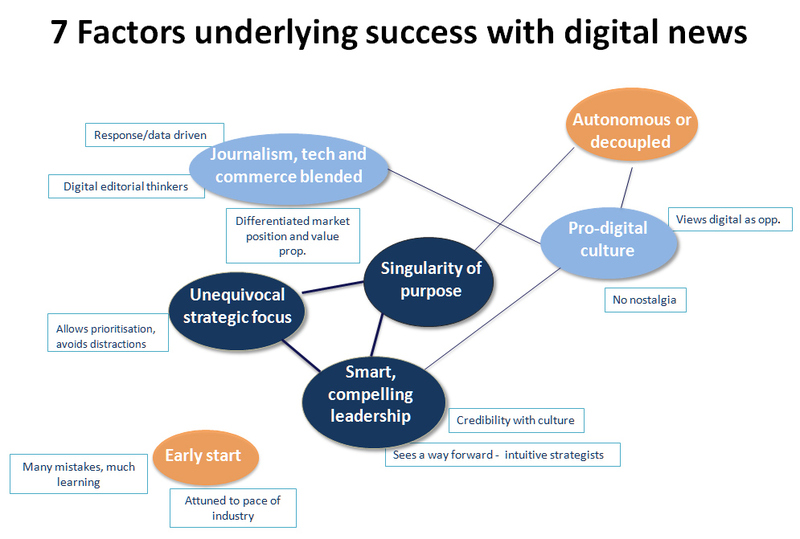 Last week saw the publication of my new book, “Innovators in Digital News“, exploring several key players in the digital news industry – the Guardian, the New York Times, Quartz, BuzzFeed and Vice. It identifies and discusses the common elements that underlie their success, and provides pointers for how all players, legacy and clean sheet, can seize the growth potential that digital markets present. How do they operate? How do they innovate? Based on first hand research, the book’s case studies explore how these organisations approach digital news. How do they approach digital journalism? How are these activities are anchored in the larger organisation? What corporate strategies, cultures and competencies do they have? The final chapter of the book sifts through the detail of the case studies to identify factors common to these organisations that contribute to their success. It highlights a set of interlinked elements which need to be viewed systemically: their power lies in their combination, in the virtuous circle that is created when all are present and function together. © Lucy Küng 2015. All rights reserved.